Infectious, Entomodermoscopy, Scabies, Tungiasis, Cutaneous larva migrans, Pediculosis, Tinea nigra, Demodicidosis, Molluscum contagiosum, HPV Infectious skin diseases (Entomodermoscopy) – cite! Infectious skin diseases (Entomodermoscopy) (message) Infectious skin diseases (Entomodermoscopy) – participate! Specific dermoscopic patterns have been described for several infectious skin diseases, including those of viral, fungal and parasitic origin. Of note, use of the new-generations dermatoscopes that do not require direct contact to the skin minimizes the risk of transfection. Interestingly, while the risk of bacterial contamination with dermoscopic examination is reported to be low, viral transmission might still represent a possible problem. ScabiesThis glossary term has not yet been described. The typical dermoscopic pattern of scabiesThis glossary term has not yet been described. consists of small dark brown triangular structuresThis glossary term has not yet been described. located at the end of whitish structureless lines (curved or wavy), giving an appearance reminiscent of a delta-wing jet with contrail (Fig 9a). Microscopically, the brown triangle corresponds to the pigmented anterior part of the mite, while the burrow of the mite correlates dermoscopically to the contrail feature. Since then, the value of dermoscopyThe examination of [skin lesions] with a 'dermatoscope'. This traditionally consists of a magnifier (typically x10), a non-polarised light source, a transparent plate and a liquid medium between the instrument and the skin, and allows inspection of skin lesions unobstructed by skin surface reflections. Modern dermatoscopes dispense with the use of liquid medium and instead use polarised light to cancel out skin surface reflections. in diagnosisis the identification of the nature and cause of a certain phenomenon. Diagnosis is used in many different disciplines with variations in the use of logic, analytics, and experience to determine "cause and effect". In systems engineering and computer science, it is typically used to determine the causes of symptoms, mitigations, and solutions of scabies has been extensively investigated in several studies. The diagnostic accuracyThis glossary term has not yet been described. of the technique was reported to be at least equal to traditional ex-vivo microscopic examination (i.e. skin scraping), while additional comparative advantages of dermoscopy include its non-invasiveness and lower requirements in terms of time, costs and experience. Nowadays, dermoscopy has replaced ex-vivo microscopy as the routine method for diagnosis of scabies in several dermatology centers. Additional to its value for diagnosis, dermoscopy may also be useful in treatment monitoring, heralding treatment success when dermoscopic ‘jet with contrail’ features can no longer been detected. TungiasisThis glossary term has not yet been described. Tungiasis is a skin infestation caused by the sand flea Tunga penetrans and is mainly endemic in the tropical regions of South and Central America, Africa, Asia and the Caribbean Islands. Because of its low incidence outside endemic areas, its clinical features are less recognized and diagnosis may be delayed. DermoscopyThe examination of [skin lesions] with a 'dermatoscope'. This traditionally consists of a magnifier (typically x10), a non-polarised light source, a transparent plate and a liquid medium between the instrument and the skin, and allows inspection of skin lesions unobstructed by skin surface reflections. Modern dermatoscopes dispense with the use of liquid medium and instead use polarised light to cancel out skin surface reflections. of the disease typically reveals a white to flesh colored to light brown nodule with a central targetoid brownish ring, which in turn surrounds a central (often blackish) pore. Cutaneous larva migransis a skin disease in humans, caused by the larvae of various nematode parasites of the hookworm family (Ancylostomatidae). The most common species causing this disease in the Americas is Ancylostoma braziliense. These parasites live in the intestines of dogs, cats, and wild animals and should not be confused with other members of the hookworm family for which humans are definitive hosts, namely Ancylostoma duodenale and Necator americanus. Dermoscopy has been shown to facilitate the clinical recognition of larva migransThis glossary term has not yet been described. (creeping eruption), by revealing translucent brownish structureless areas in a segmental arrangementThis glossary term has not yet been described., corresponding to the body of the larva. PediculosisThis glossary term has not yet been described. Dermoscopy allows a rapid and reliable diagnosis of pediculosisThis glossary term has not yet been described. by revealing the liceThis glossary term has not yet been described. itself or the nits fixed to the hair shaftThis glossary term has not yet been described. (Fig 9b).Nits containing vital nymphs dermoscopically display ovoid brown structures, while the empty nits are translucent and typically show a plane and fissured free ending. This information is particularly useful for treatment monitoring, since dermoscopic detection of vital nits should lead to a continuation or modification of therapy. Additionally, dermoscopy has been recently shown to enable the discrimination between nits and the so-called pseudo-nits, such as hair casts, debris of hair spray or gel. The latter are not firmly attached to the hair shaft and appear dermoscopically as amorphous, whitish structures. Tick bitesThis glossary term has not yet been described. Dermoscopy has been reported to highlight the presence of tick infestation by enabling the visualization of their anterior legs protruding from the surface of the skinThis glossary term has not yet been described., while a brown to grey translucent ‘shield’ with pigmented streakslines radial (always at periphery) streaks Reed nevus melanoma recurrent nevus corresponds to the tick’s body (Fig 9d). Following the removal of the tick, detection of brown to black to grey areas of pigmentation by dermoscopy indicates incomplete removal. DemodicidosisThis glossary term has not yet been described. Authors: Horacio Cabo, Emilia Cohen Sabban, Rosario Peralta. Common wartsThis glossary term has not yet been described. (verruca vulgaris) dermoscopically display multiple densely packed papillae, each containing a central red dotSee [[Glossary:Dots|Dots]] or loop, which is surrounded by a whitish halo. Hemorrhages represent a possible additional feature, appearing as irregularly distributed, small, red to black tiny dots or streaks. Dermoscopy of plantar warts typically reveals multiple prominent hemorrhages within a well-defined, yellowish papilliform surface, in which skin lines are interrupted. This pattern is particularly useful for their discrimination from callus, which lacks blood spots, but instead displays central reddish to bluish structureless pigmentation. Dermoscopy of plane warts typically reveals regularly distributed, tiny, red dots on a light brown to yellow background. These findings allow differentiation from acne or folliculitis, which display a central white to yellow pore corresponding to the comedo or pus within the hair follicle opening. The dermoscopic pattern of genital warts was initially described as a mosaic pattern consisting of a white reticular networkThis glossary term has not yet been described. surrounding central small islands of unaffected mucosal skin. More recently, the authors of a study including a large number of patients identified 4 different dermoscopic patterns, which may also coexist in a single wart: unspecific, fingerlike, mosaic and knoblike pattern. Concerning vessels morphologyThis glossary term has not yet been described., glomerular, hairpin/dotted, and glomerular/dotted vesselstiny pinpoint vessels were detected. Molluscum contagiosum is due to a poxvirus infectionThis glossary term has not yet been described. and has a characteristic dermoscopic pattern that may facilitate its clinical recognition in selected cases. Dermoscopy is especially useful in detecting the infection before the development of numerous lesions, in pediatric dermatology, or in immunosuppressed patients who may display unusual clinical manifestations. 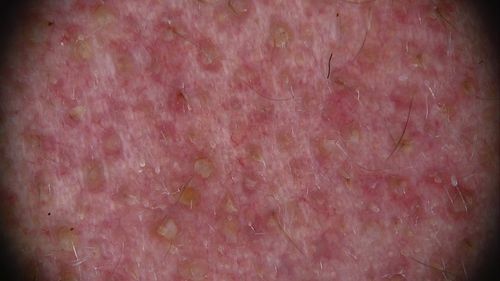 A central pore or umbilication in conjunction with polylobular white to yellow amorphous structures, surrounded by linear or branched vessels (‘red corona’), compose the stereotypic dermoscopic pattern of the disease (Fig 9c). ↑ 1.01.11.21.3 Zalaudek et al. : Entodermoscopy: a new tool for diagnosing skin infections and infestations. Dermatology (Basel) 2008;216:14-23. PMID: 18032894. DOI. ↑ Penso-Assathiany et al. : Presence and persistence of human papillomavirus types 1, 2, 3, 4, 27, and 57 on dermoscope before and after examination of plantar warts and after cleaning. J. Am. Acad. Dermatol. 2013;68:185-6. PMID: 23244381. DOI. ↑ Argenziano et al. : Epiluminescence microscopy. A new approach to in vivo detection of Sarcoptes scabiei. Arch Dermatol 1997;133:751-3. PMID: 9197830. ↑ Bauer et al. : Nodular scabies detected by computed dermatoscopyThe examination of [skin lesions] with a 'dermatoscope'. This traditionally consists of a magnifier (typically x10), a non-polarised light source, a transparent plate and a liquid medium between the instrument and the skin, and allows inspection of skin lesions unobstructed by skin surface reflections. Modern dermatoscopes dispense with the use of liquid medium and instead use polarised light to cancel out skin surface reflections.. Dermatology (Basel) 2001;203:190-1. PMID: 11586026. ↑ Prins et al. : Dermoscopy for the in vivo detection of sarcoptes scabiei. Dermatology (Basel) 2004;208:241-3. PMID: 15118379. DOI. ↑ 6.06.1 Walter et al. : Comparison of dermoscopy, skin scraping, and the adhesive tape testThis glossary term has not yet been described. for the diagnosis of scabies in a resource-poor setting. Arch Dermatol 2011;147:468-73. PMID: 21482897. DOI. ↑ 7.07.1 Park et al. : The diagnostic accuracy of dermoscopy for scabies. Ann Dermatol 2012;24:194-9. PMID: 22577271. DOI. ↑ Hamm et al. : Treatment of scabies with 5% permethrin cream: results of a German multicenter study. J Dtsch Dermatol Ges 2006;4:407-13. PMID: 16686608. DOI. ↑ Bauer et al. : Dermoscopy of tungiasisThis glossary term has not yet been described.. Arch Dermatol 2004;140:761-3. PMID: 15210479. DOI. ↑ Bauer et al. : Variability of dermoscopic features of tungiasis. Arch Dermatol 2005;141:643-4. PMID: 15897397. DOI. ↑ Veraldi et al. : Epiluminescence microscopy in cutaneous larva migransis a skin disease in humans, caused by the larvae of various nematode parasites of the hookworm family (Ancylostomatidae). The most common species causing this disease in the Americas is Ancylostoma braziliense. These parasites live in the intestines of dogs, cats, and wild animals and should not be confused with other members of the hookworm family for which humans are definitive hosts, namely Ancylostoma duodenale and Necator americanus.. Acta Derm. Venereol. 2000;80:233. PMID: 10954233. ↑ Micali et al. : DermatoscopyThe examination of [skin lesions] with a 'dermatoscope'. This traditionally consists of a magnifier (typically x10), a non-polarised light source, a transparent plate and a liquid medium between the instrument and the skin, and allows inspection of skin lesions unobstructed by skin surface reflections. Modern dermatoscopes dispense with the use of liquid medium and instead use polarised light to cancel out skin surface reflections. : alternative uses in daily clinical practice. J. Am. Acad. Dermatol. 2011;64:1135-46. PMID: 21292346. DOI. ↑ Di Stefani et al. : Dermoscopy for diagnosis and treatment monitoring of pediculosis capitis. J. Am. Acad. Dermatol. 2006;54:909-11. PMID: 16635683. DOI. ↑ Zalaudek & Argenziano: ImagesA representation of a person, animal or thing, photographed, painted or otherwise made visible. in clinical medicine. Dermoscopy of nits and pseudonits. N. Engl. J. Med. 2012;367:1741. PMID: 23113485. DOI. ↑ Oiso et al. 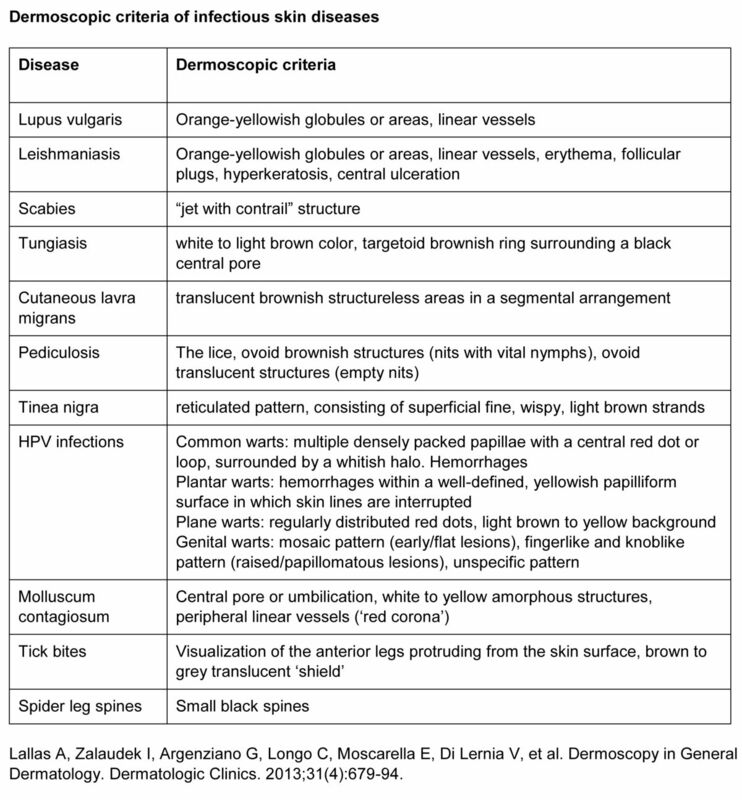 : Diagnostic effectiveness of dermoscopy for tick bite. J Eur Acad Dermatol Venereol 2010;24:231-2. PMID: 19686261. DOI. ↑ Matsuda et al. : Dermoscopy for tick bite: reconfirmation of the usefulness for the initial diagnosis. Case Rep Dermatol 2011;3:94-7. PMID: 21577370. DOI. ↑ Friedman et al. : Usefulness of dermoscopy in the diagnosis and monitoring treatment of demodicidosisThis glossary term has not yet been described.. Dermatol Pract Concept 2017;7:35-38. PMID: 28243492. DOI. ↑ Segal et al. : Dermoscopy as a diagnostic tool in demodicidosis. Int. J. Dermatol. 2010;49:1018-23. PMID: 20931672. ↑ Tanioka et al. : Pigmented wart due to human papilloma virus type 60 showing parallel ridge patternVolar pigmentation forming lines, parallel, diffuse and irregular, along the ridges or cristae superficiales (raised portion of the dermatoglyphics) in dermoscopy. Eur J Dermatol 2009;19:643-4. PMID: 19709979. DOI. ↑ Yoong et al. : Unusual clinical and dermoscopic presentationThis glossary term has not yet been described. of a wart. Australas. J. Dermatol. 2009;50:228-9. PMID: 19659993. DOI. ↑ Dalmau et al. : AcralPertaining to peripheral body parts, especially hands, feet, fingers, and toes. melanomaThis glossary term has not yet been described. simulating warts: dermoscopic cluesEvidence, in an investigation to prevent missing a melanoma. Dermatol Surg 2006;32:1072-8. PMID: 16918571. DOI. ↑ Morales et al. : Dermoscopy of molluscum contagiosumThis glossary term has not yet been described.. Arch Dermatol 2005;141:1644. PMID: 16365277. DOI. ↑ Ianhez et al. : Dermoscopic patterns of molluscum contagiosum: a study of 211 lesions confirmed by histopathologyThis glossary term has not yet been described.. An Bras Dermatol 2011;86:74-9. PMID: 21437525. This page was last modified on 27 October 2018, at 12:14.